This Dark green painted metal bucket has a collapsible handle Size: 7" x 6.5" x 9.25"H. This container is filled with 4 beer and Pistachios. Great gift for any golfer. Comes shrink wrapped with a card and bow. 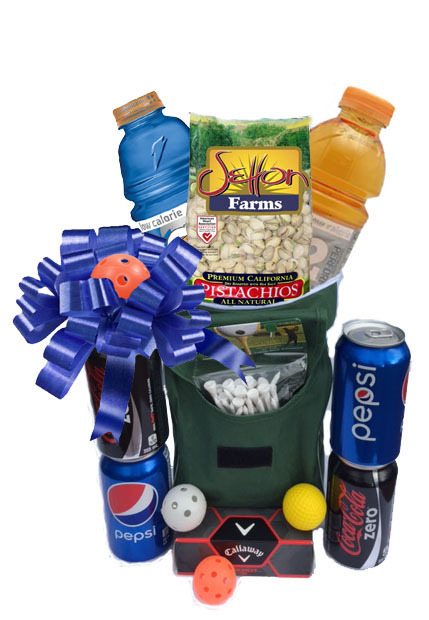 This green and white canvas golf bag with plastic interior holds six cans, zipper top and back pocket, large front pocket with Velcro closure and detachable nylon handle strap Size: 6" x 12" comes filled with 4 cans of pop, 2 G2 sport drinks, 3 Callaway golf balls, 3 practice balls, golf tees and Pistachios. Awesome gift item for any golfer. Comes shrink wrapped with a card and bow. 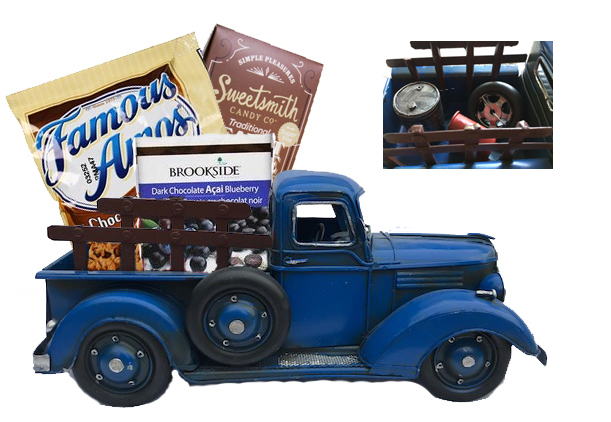 Awesome metal truck (13" long by 6" high) comes with Brookside Dark Chocolate (20g), Famous Amos Chocolate Chip Cookies 56g and Sweetsmith Peanut Brittle (56g). Comes shrink wrapped with a bow and card. 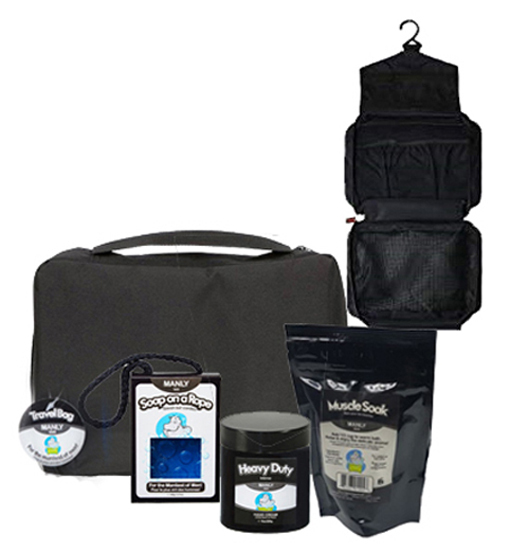 Made in Alberta Happy Hippo products for the hardworking man on the go! This Travel Bag (8 1/2" x 7 1/2") has a unique S-HOOK to hang anywhere. Comes with Muscle Soak (all these products have a warm citrus blend with a bit of spice for the manliest of men.) To relax & relief of tired achy muscles, add 1/3 cup to a warm bath). Soap on a rope (Glycerine soap on a rope). The Heavy Duty Hand Cream (For the hardworking man! Apply to clean, dry hands to help heal, protect & moisturize even the driest of hands. Ingredients: Butyrospermum parkii (shea butter), cocos nucifera (coconut) oil, theobroma cacao (cocoa) seed butter, simmondsia chinensis (jojoba) seed oil, aqua (water), glycerine, cera alba (beeswax), cetyl alcohol, cetearyl alcohol & polysorbate 60, stearic acid, sodium borate, phenoxyethanol & caprylyl glycol (optiphen), sorbic acid, zinc oxide, and tocopherol (vitamin E). Comes in a black gift bag with a card. 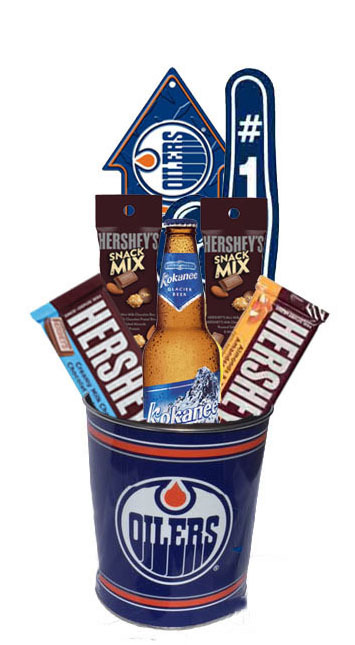 This Oilers Tin (7 1/2" high) contains an Oilers Foam Finger (18") , Metal OILERS COUNTRY sign (19 1/2") in an arrow shape, two Hersey's Bar, and two Hershey's Mix and a bottle of Beer. This tin comes shrink wrapped with a card and bow. Perfect gift for any Oiler fan. 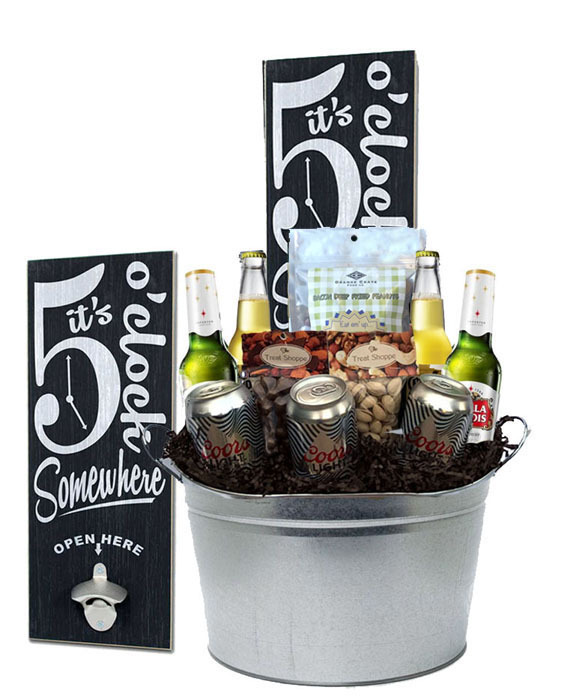 This reusable metal container (13.75" x 7.5" x 6.75") is piled high with 7 beers, pistachios, chocolate covered raisins and the ultimate item for the "Man Cave" an It's 5 o'clock somewhere bottle opener (measurements;� 6.75"w x 18"h x�1/2"d). This gift comes cello wrapped with a bow, and card. Available for delivery only in Edmonton, Alberta and the metro area. This beautiful metal container (14"L 8"W 6"H) is filled with 2 Cedar grilling planks that are easy to use on gas & charcoal grills. Plank grilling works great for salmon, ribs, beef, vegetables and more. 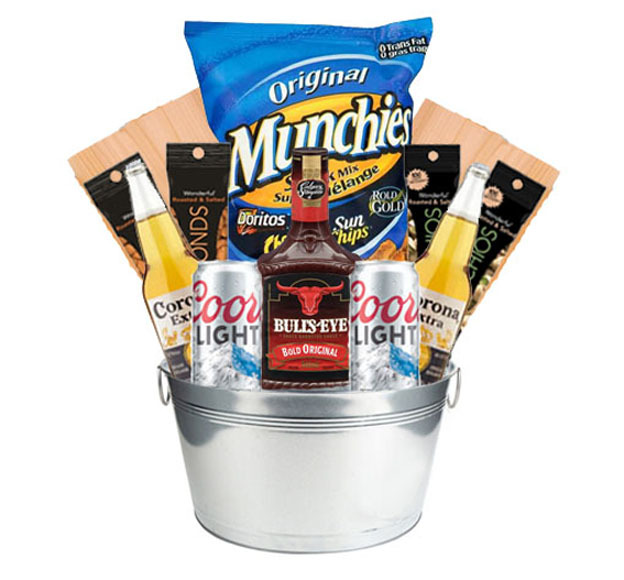 Also 4 beer, Bull's Eye Sauce, Original Munchies, and nuts. 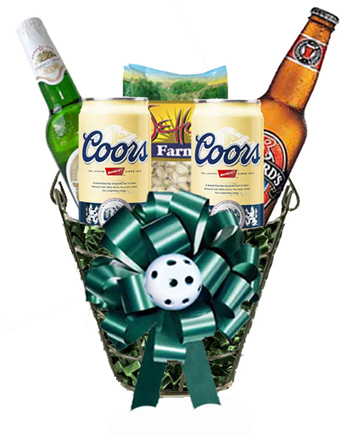 What a great BBQ gift for anyone on your list. Available for delivery only in Edmonton, Alberta and the metro area. Comes shrink wrapped with a card and bow.